A young black boy overcomes prejudice to become a cowboy, and earns himself a pair of new boots. Commission: Commissioned by The Opera Theatre of St. Louis and The Kansas City Lyric Opera. 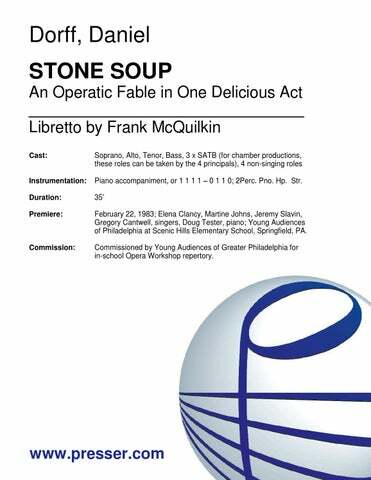 Premiere: June 11, 1998; Opera Theatre of St. Louis. 2000; Kansas City Lyric Opera. This through-composed piece with lively music by Adolphus Hailstork and a clever libretto by Susan Kander is singable by older students and a few young professionals, but sophisticated enough to qualify as opera. Engaging and heartwarming…It favors a tangy Franco-American lyricism, while assimilating echoes of spirituals, cowboy songs and jazzy inflections. In a zoo of the future, populated not by animals but by robots in animal form, Mooch, an orphan girl, convinces the zookeeper to hire her to fix the robots when they break down, but she is actually reprogramming them to be increasingly wild. The opera takes place in a dome-covered city that is part of a worldwide network of such cities, connected by travel tubes, sealed off from the outside. The time is late twenty-first century, after human beings, afraid of the wilds, have moved indoors. Instr: Cl. Vcl. Pno. Perc. Commission: Commissioned by Roundabout Opera for Kids, Kimberly Carballo, director. Premiere: August 31, 2012. Roundabout Opera for Kids. Sara Radke, director; Monroe County Public Library, Bloomington, IN. 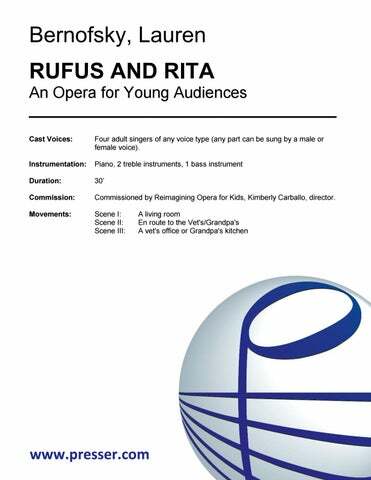 Rufus and Rita is an opera with a flexible storyline in which the the decisions of its characters are decided upon by the audience. The adventure begins with Rufus, a dog, searching for something to eat. The audience decides what Rufus sinks his/her teeth into, setting the cast on a hilarious trip to the vet or to Grandpa’s house. Both the cast and the instrumentalists parts require a degree of improvisation as they must quickly navigate through the “plot twists” at several points in the show. Different musical numbers, as well as props and set accessories, are determined by the choices of the audience. 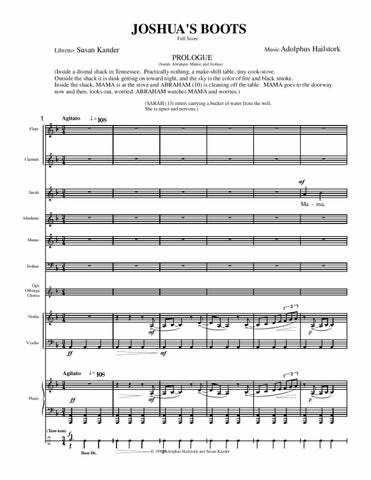 Cast: Four adult singers of any voice type (any part can be sung by a male or female voice). Instr: Piano, two treble instruments, one bass instrument. A piano/vocal version is also available. Commission: Commissioned by Reimagining Opera for Kids, Kimberly Carballo, director. The traditional tale, teaching the benefits of sharing and the perils of deception, designed as a highly portable production with simple costumes, easy props, and no special sets required. Instr: Piano accompaniment, or 1 1 1 1 – 0 1 1 0; 2Perc. Pno. Hp. Str. 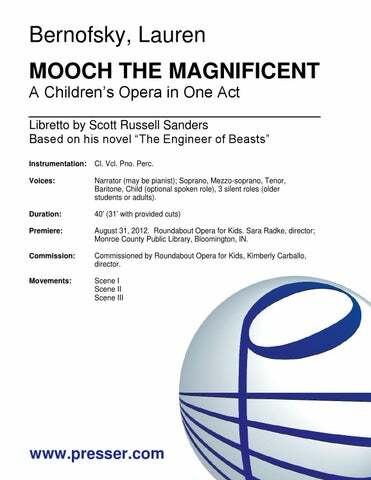 Commission: Commissioned by Young Audiences of Greater Philadelphia for in-school Opera Workshop repertory. Premiere: February 22, 1983; Elena Clancy, Martine Johns, Jeremy Slavin, Gregory Cantwell, singers, and Doug Tester, piano; Young Audiences of Philadelphia at Scenic Hills Elementary School, Springfield, PA.